Let me start with a big bold statement… ready? 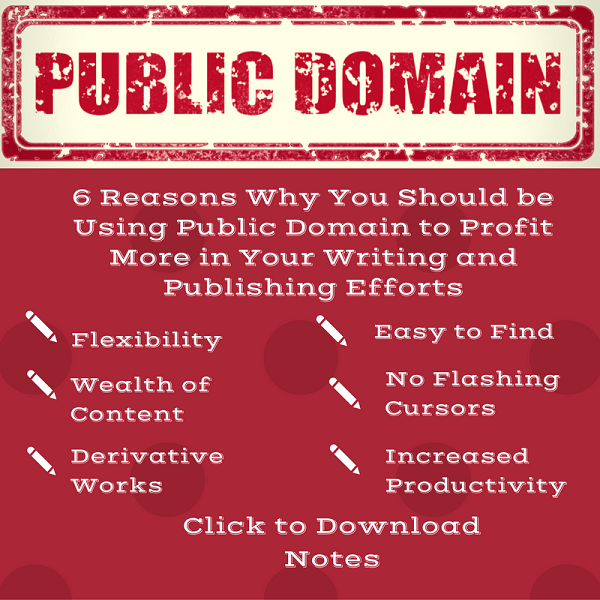 Properly using quality public domain content can transform your writing and publishing endeavors and be way more profitable than you can imagine. The public domain is generally defined as consisting of works that are either ineligible for copyright protection or with expired copyrights. No permission whatsoever is needed to copy or use public domain works. The definition gives rise to the first reason you should use public domain content in your writing/ publishing endeavors; namely, flexibility. That is, if a work is in the public domain then it can be used in any way, by any citizen of the country where it is in the public domain, without asking for permission and without paying royalties (using public domain is FREE). Effectively you can use the content: sell it, change it, add to it or subtract from it without limitation. The sky is the limit with public domain. The long and the short of it is if you find a suitable public domain work you can use it in any way you wish. That is ultimate flexibility.